I was glad to see #1 on this list from J. I. Packer. For my part, I have no objection whatever to the subjective genitive reading of the pistis christou (faith/faithfulness of Christ) formulas other than that it is wrong. Whether Westerholm is right or not, I look forward to the volume edited by Mike Bird and Preston Sprinkle, The Faith of Jesus Christ, to be out in 2009 by Paternoster, which I'm hoping will help me settle the matter in my own mind. Richard Bell teaches theology at the University of Nottingham in north-central England. He had a dramatic conversion experience as a student investigating All Souls Church in London (where John Stott and Richard Bewes were rectors). He shares his story here. After finishing his PhD in theoretical atomic physics, he went to Oxford and then Tubingen to study theology. His dissertation was written under Peter Stuhlmacher on Rom 9-11. He's written three NT monographs (1994, 1998, 2005, all published in the WUNT series). I mention him because of the fascinating autobiographical account that opens up the third of his monographs (The Irrevocable Call of God - yours for only $165, which at 550 pp is 3 pages per dollar). I was fascinated to discover in a book left to me by my grandfather that C. S. Lewis was not the first to speak of “three kinds of men” (which I posted earlier)—the immoral, the moral, and the gospel. Those who don't want to obey, so they don't; those who don't want to obey, but they do; those who want to obey. Those who “have a double intention” are those who have heard and responded to the call of Christ but whose lives are consumed with other concerns, either circumstantially or morally. They “seem to be very earnest in Christian work, but their apparent devotion arises from a masterfulness of disposition that likes to be independent and rule” (150). “The heart is so deceitful,” writes Meyer, “that it becomes us to examine ourselves with all carefulness, lest at the end of life we shall find that whilst we appeared to be doing God’s work, we were really doing our own; and that whilst our friends gave us credit for great religious devotion, we were really borne along by a vain, proud, and unworthy purpose, which robbed out noblest service of all value in the sight of eternity” (151). The third group are the “pure and simple,” who have one aim in life, who pray and give in secret, who care not about the praise of men, who desire only to please God—and who are the only ones who have really discovered joy. Along with Lewis and Meyer, the two men living from whom I have learned this truth—that our options are not obedience and disobedience but immoral disobedience, moral disobedience, and gospel obedience—are Tim Keller and my dad. Just read this in Augustine's Enchiridion (on faith, hope and love), written well after, and sounding very different from, his "On the Free Choice of the Will" written in the immediate wake of his conversion in the 390s. An ever-relevant and stabilizing reminder as we open our emails and receive phone calls and spill our coffee on our computers and get poison ivy and experience rejection and generally live life in a fallen world. This looks like three days well spent for anyone. Speakers include Tim Lane, Ed Welch, David Powlinson, and Mark Driscoll. When this book first appeared in 1965, I was an undergraduate reading chemistry and mathematics. I recall thinking as I read the book that this Lloyd-Jones chap (whom at that point I still had not met) had a God-given ability to meditate on a text, and ponder it within the framework of the entire Bible. I have not changed my mind, but I would now add as well that his exposition of Psalm 73 is saturated with spiritual wisdom designed to help Christians face trials and temptations of many sorts. I am very thankful to God to see this book come back into print. The ingenuity that we have as inveterate Pelagians is unlimited. I benefited from this interview with John Frame on the propriety of the current standard seminary model. Are you an MDiv or MA student preparing for fulltime ministry? I hope you will consider taking a few extra years for a second Master's or a PhD before opening your Bible to teach others. The point is not that intellectual preparation is sufficient. According to Paul, "all knowledge," without the spark of love, is meaningless (1 Cor 13). But the kindling of study is invaluable. A fire needs a spark in order to be lit; but if no kindling exists, no amount of sparks will produce anything. [W]itty things only, as they are spoken to the brain, so they rest in the brain, and sink no deeper; but the heart (which vain and obnoxious men love not to be touched), that is the mark a faithful teacher aims to hit. --Richard Sibbes, in the preface to John Smith, Introduction to the Creed, cited in Ralph Turnbull, Jonathan Edwards the Preacher (Grand Rapids: Baker, 1958), 54. Grandpa died one year ago tonight. 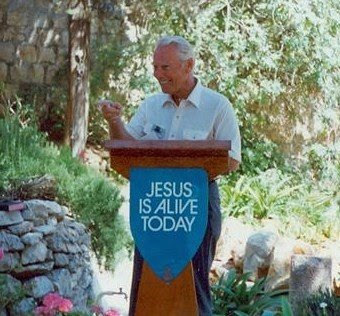 I pay tribute to the work of grace done in the life of this remarkable man--remarkable only because he was given a glimpse of how even more remarkable Christ himself, in the gospel, is. Joseph Haroutunian (1904-68) is one of my favorite Edwards scholars. I enjoyed finding this quote in his 1932 book (though Robert Jenson believes "it might have been written yesterday" [America's Theologian: A Recommendation of Jonathan Edwards, 198]) Piety Versus Moralism: The Passing of the New England Theology (repr 1964), in a chapter entitled "Reform without Regeneration." He is explicating Edwards' understanding of the new birth, a conviction that, while central to the Great Awakening of the 1740s, waned in the generation immediately following his death (on which see also Haroutunian's "Jonathan Edwards: A Study in Godliness," Journal of Religion : 400-19). My dream is not that we reproduce the 1740s today. Spiritual revivification will look and smell and feel like the 21st century, not the 18th. Nevertheless I believe that at the heart of what must be recovered in the Church today, under God, if it is to be a united and happy force in the world, is the widespread recovery of the nature of true (i.e. supernatural) conversion, as happened, among other times in history, 250 years ago. Good thought on what is needed when suffering comes. More good stuff on the relationship between valuing Christ supremely and cultivating robust doctrinal commitments. Morality is nothing in the abstract nature of things, but is entirely relative to the sentiment or mental taste of each particular being. One more indication that "postmodernism" is not as revolutionary as we've been taught. Very instructive to read Chad Hall's review of Tony Jones' latest book and Mark Driscoll's latest book, and the response of each (Jones here, Driscoll here)--and to note the telling difference between the two. All three pieces are very brief (the comments are not worth reading). I thank God for you, Mark, and hope God sends blessing upon blessing on your continued work. 747. SELF-RIGHTEOUSNESS. PRIDE. Self-righteousness is a certain kind of sin of the heart that is especially contrary to Christ and the gospel, displeasing to God and fatal to the soul. Now it may be worthy of an inquiry what lust, or which of the cardinal principles of corruption . . . it is that is exercised in self-righteousness, that belongs to the nature of this hateful disposition, and wherein its sinfulness does most essentially consist: and this is PRIDE, or an inordinate affecting our own comparative dignity, or an inordinate disposition to self-exaltation, as is evident by Luke 18:9. . . . Self-righteousness is the same with a spirit of pride, as it tends to a particular kind or sort of exercise: a self-righteous principle or disposition is the same as a disposition to exercise pride with regard to our own supposed righteousness, or moral dignity. Now pride consists mainly and most essentially in the disposition or heart, and not in the understanding, as all lusts do. Pride don't most essentially consist in a too high conceit of one's self, but in a disposition inordinately to affect our own comparative dignity. Hence, the wrong thought that children have of themselves, of their own understanding and strength and self-sufficiency, is on this account far more innocent than the inordinate conceit grown persons have of themselves, because it arises more from mere ignorance, and so less from a proud disposition. A wrong conceit of one's own dignity is a proud haughty conceit no farther and no otherwise than as it proceeds from a self-exalting disposition. Edwards' insight: self-righteousness/pride is not mainly intellectual, cognitive, mental. It is that; but that isn't what makes pride evil. What makes it evil is that it is affective. It is not just thinking you are better; it is enjoying thinking you are better. Pride is about what you love. The path to humility, then, it would seem, is not thinking low thoughts of yourself (of which C. S. Lewis reminds us in Mere Christianity). It is ordering our affections aright: loving God centrally, with self-adjudication following from that. was as Great an Instrument as the Devil Had on this Side of Hell to bring Souls to Hell. Well guys, let's just get ready for the crap. The unjust criticism. The subtle, whispered, smearing. If Edwards got it, we're going to get it. Historical accounts of the trial that would take place fifteen years later that eventuated in Edwards' dismissal by a vote of 10 to 1 recount that Edwards was inexplicably serene throughout the trial. Let's learn from our father and gladly submit to the unfairnesses of life, instead of defending ourselves. The antidote, it seems to me, to the intellectual trends of all times. On another note, I'm immersed in Augustine this week, of whom the resources at the ND library are vast. Up till now all I knew was the Confessions and a bit of sketchy biographical information. This week I read "On the Happy Life" and his "Soliloquies," and a few books on his theology, and Augustine is opening up before me as I never expected him to nor realized he could. I have discovered someone who will, I think, be a lifelong friend. His development of the truth that, as Pascal said, "all men seek happiness, even those who hang themselves," and explaining how that happiness is satisfied, is wonderfully stabilizing. Great interview of J. I. Packer by my reformed baptist brothers. Discusses evangelicalism and the gospel. Dated (1994), but just as helpful to read today. --Paul Tripp, A Quest for More: Living for Something Bigger Than You (2007). This afternoon I read one of the most beautiful sermons by Edwards I've ever read, "Great Guilt No Obstacle to the Pardon of the Returning Sinner." It is based on Ps 25:11 - "For the sake of your name, O Lord, pardon my iniquity, for it is great." I expected him to extrapolate on the first third of that verse - "for the sake of your name." That would have been typical Edwards. But he doesn't. He fixes his gaze on the last third - "for it is great." He reflects at length on the remarkable prayer David makes here. The prayer is not "Forgive my iniquity, for it is small," or "forgive my iniquity, in spite of the fact that it is great." But "forgive my iniquity for it is great." The recognition that I am exceedingly guilty before God is not a hindrance to coming to him, but is, oddly, the very basis that makes my coming to him meaningful. I find that extremely liberating. I'm reading Peter Brown's biography of Augustine and finding all sorts of fascinating things, like the account of Augustine's baptism. What if we did something like this today? Passing behind curtains, Augustine would descend, alone, stark naked, into a deep pool of water. Three times, Ambrose would hold his shoulders beneath the gushing fountain. Later, dressed in a pure white robe, he would enter the main basilica ablaze with candles; and, amid the acclamations of the congregation, he and his fellow neophytes would take their place on a slightly raised floor by the altar, for a first participation in the mysteries of the risen Christ. The theme of 'putting off the old,' of 'putting on the new,' of rebirth and rising again from death, of the consequent ascent of the soul to heaven made possible by the descent of Christ to earth, reverberated in Augustine's imagination. Just finished my first week of a three-week class on Paul at Notre Dame, taught by Jerome Murphy-O'Connor, a well-known Paul scholar who lives and teaches in Jerusalem. He has focused especially on Corinth and the Corinthian correspondence, and his work was especially helpful to me as I worked on 2 Cor in my ThM. I'm grateful to participate in the class, which is stretching me in all sorts of ways. - In John 20:14, Mary 'turns' and sees Jesus. In v. 16, she 'turns' again and looks at Jesus. Therefore in v. 14 she must have actually been looking at the gardener, as she had initially thought. Therefore this passage was probably a later, uncareful interpolation. - According to Paul, all those outside the church are not damned, because they cannot be damned on account of something of which they are not aware (the gospel). It is a privilege to be here, and I am genuinely learning a lot. I have so much to learn. And I have had great conversations with other believers. I had a two-hour talk with a PCA-turned-catholic guy on Calvinism that was a joy (not rancorous in the least, mostly due to his humility and patience with me). The library is great, and the whole experience of being immersed in Roman Catholic higher education is fascinating. But as I sit in the class, I am sad for those who are diving into Paul for the first time (about 90% of the class; one girl didn't know where the books of the Bible were) and hearing dogmatic statements made that stand over, rather than sit under, Scripture. From "Unbelievers Contempt the Glory of Christ," a 1736 sermon by Jonathan Edwards. Christ is the darling of heaven, he was eternally God's delight; and because of his glory God has thought him worthy to be appointed the heir of all things. . . . Is he thus worthy of the infinite esteem and love of God himself? and is he worthy of no esteem from you? Edwards is showing that if God the Father himself has been adoring Christ from all eternity, what possible room for excuse could there possibly be that we, too, therefore, do not adore him. And here's an especially convicting passage. Contempt of any person is heinous in proportion to the worthiness and dignity of the person contempted. Though we are but worms of the dust, and very vile, sinful creatures; yet we take it grievously when we are despised. Consider how you yourselves are ready to resent it, when any of your neighbors seem to slight you. . . . Are you not ready to look upon it with resentment, and to judge that you have great cause to be offended? For me, my eyes are opened both to how easily I needlessly and pridefully feel offended by others, my equals, and also how weightless a thing it has seemed to me how patient God is with me instead of, as I do toward others, allowing my silly selfishnesses to offend him. I am just beginning to understand grace. Happy birthday to someone who has been a tremendous help to me. We need the sprightly, fruitful life of joy. This Paul holds out before the Philippians, that they through Christ in God might have the ever-existing ground for joy. Not apart from God, in us ourselves, or in mankind or in things, should we seek joy; it must arise out of God himself, because Jesus has connected us with God, and with him we find joy in every circumstance. --Erlauterungen zum Neuen Testament, Band 8: Die Briefe an die Thessalonicher, Philipper, Timotheus, und Titus (Stuttgart: Calwer, 1987). Would love to be at this conference this Fall in the Wheaton area. As of today, the new website for the Gospel Coalition is up and running. We get hung up when we put the emphasis on "Moses" instead of on "believed." In other words, the point is not, "If you believed Moses, you would believe me," but "If you believed Moses, you would believe me." The problem was not the Jews' theology but their dispositional stance of unbelief. Their problem was not that they trusted what said Moses too strongly. They didn't trust it enough. Graham Stanton has a very helpful little article on Paul's "gospel" in this book, edited by Dunn. He concludes that the gospel is "the glad tidings of God's once for all dynamic salvific act through Christ" (182). That is, "'Christ crucified for our salvation' is the central theme of Paul's gospel." (178). I call his brief treatment helpful because it avoids some of the puzzling but fashionable expositions of the gospel on market today (N. T. Wright's and Michael Gorman's proposal, for example, that the gospel is "Jesus is Lord"). Stanton rightly fixes on 1 Cor 15:1-8 as a (the?) central text for explicating Paul's gospel, and also rightly makes Paul's gospel vertical first and horizontal derivatively. He also helpfully shows that while "gospel/good news" would be heard against the backdrop of the imperial cult (i.e. "Caesar is Lord"), Paul is mainly contrasting his use of gospel with the secular use, rather than employing it in the same way (i.e. referring mainly to lordship/authority). Flew home from Nashville last night after 2 weeks of relaxing with my family. Driving tomorrow to Notre Dame for 3 weeks. Light posting to continue!